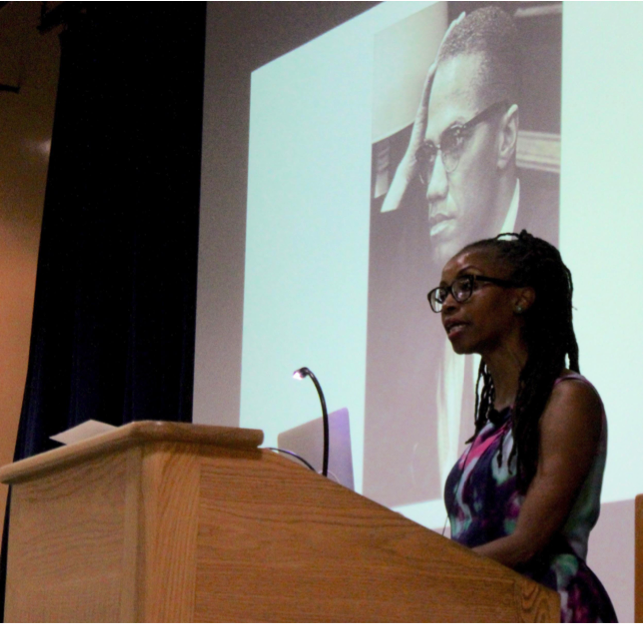 UCSB alumna Ula Taylor spoke on the relationship between Malcolm X and the Nation of Islam to students in Embarcadero Hall. Author and UC Santa Barbara alumna Ula Taylor describes this gender inequality in her book The Promise of Patriarchy: Women and The Nation of Islam, which she spoke about earlier this month at Embarcadero Hall. The book, a collection of narratives, shows how women have played traditional roles in the NOI while trying to gain freedom from the discrimination of 20th century America. Segregation, race violence and belligerent protests persuaded women to join a community where they subverted their rights as women in favor of the struggle for racial equality. Black women turned to the Nation of Islam for sanctuary. Schools were better for their children, women were free to walk around at night within the community, and women felt protected by men in their community. But this protection came at a price, Taylor said. Women were heavily restricted within the Nation of Islam, especially when it came to wandering out of the community at night. “Believing that black women were out of control justified restrictions of women in the Nation of Islam and these restrictions had a lot to do with women being outside by themselves at night,” Taylor said. She described women wrote letters to NOI founder Elijah Mohammad, asking for approval to stay out at night. He would instruct his secretaries to tell the women to ask their professors to give them classes that met in the daytime. “He would think of all these alternatives. But in the end, he always concluded that he did not approve of a sister being out at night,” Taylor explained. Her book tells personal stories of women involved in the modern civil rights movement, figures such as Sonia Sanchez, a renowned poet and follower of Malcolm X, who found solace in the Nation of Islam after his untimely death in 1965. Gwendolyn Zoharah Simmons, a University of Florida professor of religion, eventually attained a high position in the Nation of Islam. Taylor recounted Simmons’ journey from Jim Crow violence to becoming a member of the Student Nonviolent Coordinating Committee (SNCC), and her public identity as a feminist until she joined the Nation of Islam. Taylor said it is important to retell stories of these powerful women to show the hardships women faced in the paradoxical Nation of Islam. UCSB alumna Ula Taylor reads an excerpt from her book, The Promise of Patriarchy: Women in the Nation of Islam, to students at Embarcadero Hall on November 1st, 2018. Taylor’s “web of conversation” refers to complicated relationships between women and activist leaders in the modern civil rights movement. Malcolm X’s death proved difficult for Sanchez, who admired his work on behalf of African American rights. Malcolm X eventually left the NOI due to controversy regarding his remarks on President Kennedy's death and his criticism of organization leader Elijah Muhammad's adultery. Even after Malcolm X’s resignation from the NOI and his assassination, Sanchez joined the NOI, believing his beliefs about African American rights were still the foundation of the political group. “I know it sounds odd to say, but the reason I ended up in the Nation of Islam, is because of Malcolm X,” Sonia Sanchez told Taylor in an interview the author conducted for her book. Audience members identified with these stories. Graduate English student Kaaronica Evans-Ware, an African-American Muslim, said she found the struggle of women in the Nation of Islam to be much like to her efforts to find respect in modern-day America. “I got emotional when she started to speak about the vulnerabilities that a lot of African-American women felt at the height of the Nation of Islam,” Evans-Ware said after the talk. Taylor said she hoped to capture the human experience in her book and new insight into the role of women in a patriarchal black nationalist organization. Chicano/a history professor Miroslava Chavez-Garcia hosted the event to shed light on women in the NOI, which is not often examined. Chavez-Garcia, author of Migrant Longing, Courtship, and Gendered Identity in the U.S.-Mexico Borderlands, believes in the power of storytelling within the history discipline. Mika Kaczmar is a Fourth-year Communication Major.